The Big Bend Region of west Texas is Just Ahead’s first smartphone audio guide for the Lone Star State. The new guide covers all the beauty and attractions of Brewster County—the largest county in Texas, and home to Big Bend National Park. Just Ahead’s newest guide leads you through Great Smoky Mountains National Park, a park perfectly suited to a Just Ahead smartphone audio tour. Superb roads wind through its densely forested mountains, revealing vistas that stretch across ridge after ridge, each gently softened by the natural haze that accounts for the “smoky” in Great Smoky Mountains. All you need to do is turn on the app and drive. As you approach the park’s sights, Just Ahead tells you exactly what you’re seeing. What Are the Best Sights in Rocky Mountain National Park? This post is part of Just Ahead’s Rocky Mountain National Park trip planner—our guide to everything you need to know to plan your trip to Rocky Mountain. Click here to see the complete series, and be sure to download our Just Ahead smartphone audio tour of Rocky Mountain before you head to the park. We’ll guide you to and through the park and all its scenic wonders. Trail Ridge Road is generally open from late May to mid-October. Check the park’s Road Status Report for the latest details. Longs Peak (14,259 feet) is the park’s highest summit. The hike to the top is very challenging. A superb alternative is the day hike to beautiful Chasm Lake at the mountain’s base. NPS photo by Crystal Brindle. When a mountain rises 14,259 feet high, you can be certain that it’s visible from many places. Such is the case with Longs Peak, tallest summit in Rocky Mountain National Park, and the park’s only fourteener. You can see it from the town of Estes Park, from the treeless tundra surrounding Tundra Communities Trail, from Mountain Overlook, and from many other places that we call out during your Just Ahead tour of the park. Quite often you’ll see Longs Peak’s neighbor, Mount Meeker (13,911 feet), in the same view. Thousands of hikers climb Longs Peak each year, but it requires a strenuous 15-mile round trip. And excellent alternative is the 8.4-mile round trip to Chasm Lake. At the base of the sheer north face of Longs Peak, the lake offers an alpine scene as memorable as any in the park. Rocky Mountain is rife with wildlife and wildlife-viewing opportunities. Elk are the most noble and charismatic of the animals you are likely to see. It’s impossible to forget the sight of a big male, weighing close to half a ton, and his huge, spreading antlers. Elk roam widely throughout the park, feeding at high elevations in summer and moving down to lower valleys in fall. In autumn, the males’ calls echo around the park. In summer, you may see elk along Trail Ridge Road. In fall, watch for them early and late in the day around the edges of meadows and grassy valleys, particularly in Horseshoe Park and Moraine Park. Just Ahead will, of course, steer you to the best places to see these magnificent animals. This post is part of Just Ahead’s Rocky Mountain National Park Trip Planner—our guide to everything you need to know to plan your trip to Rocky Mountain. 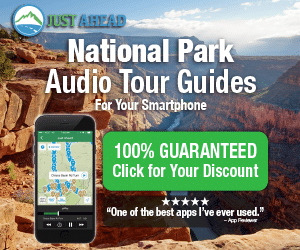 Click here to see the complete series, and be sure to download our Just Ahead smartphone audio tour of Rocky Mountain before you head to the park. Unlike most large national parks, Rocky Mountain has no in-park lodging. So where to stay in Rocky Mountain? Your best bets are its two gateway towns—Estes Park to the east and Grand Lake to the west. Both offer plenty of options, and it’s simple enough to commute from the towns into the heart of the park. To give you some sense of scale, Estes Park is 24 miles from the Alpine Visitor Center near the summit of Trail Ridge Road in the heart of the park. Grand Lake is 22 miles from the Alpine Visitor Center. Remember, Just Ahead guides you to and from both towns and throughout Rocky Mountain National Park. Estes Park, just east of Rocky Mountain National Park, is best known for the Stanley Hotel. The historic and distinctive 1909 lodge is best known for having inspired Stephen King’s novel The Shining. Contrary to rumor, the film of the same name was not filmed in the Stanley. Estes Park has many other offerings, ranging from rustic cabins to luxurious inns. For a complete list, visit the Estes Park lodging website. Where to camp in Rocky Mountain National Park? The park is uniformly gorgeous, so all of its campgrounds have the woodsy mountain beauty you’d expect. All of the campgrounds are extremely popular in the park’s summer high season, so be sure to make reservations (details below) or arrive early in the morning for the sites that are first-come, first-served. For more details and for rules and regulations, visit the park’s website. Located on US 34 just west of the Fall River entrance station (within walking distance), Aspenglen Campground has 53 sites, many of which accommodate RVs up to 30 feet. Aspenglen Campground has a unique facility—privacy stalls where you can hang your own solar shower. It’s generally open from late May to late September. Reservations are available through recreation.gov. This large, 150-site campground, is on Bear Lake Road about six miles south of the Beaver Meadows entrance station. It’s generally open from early July into the fall. Sites are available for tents and RVs up to 35 feet. Reservations are available through recreation.gov. This small, 26-site campground is for tents only and does not accept reservations. All sites are first-come, first served. Located just of US 7 south of the town of Estes Park, it’s a great location for hikers eager to take on the tough hike up Longs Peak (14,259). Generally open during the summer months only. Another honor has come our way! Just Ahead has been voted one of the top five new travel apps for 2015 in a USA Today Readers’ Choice poll. Just Ahead was selected as one of 20 nominees for the honor by a panel of experts that included editors from USA Today, expert contributors to the newspaper, and sources from other Gannett media outlets. (Gannett owns USA Today as well as 81 local newspapers and 43 television stations). After the nominees were announced, readers had four weeks during which to vote. When the results were announced on December 11, Just Ahead was among the top five winners. The honor rounded out a year during which Just Ahead was also named Best Travel App by the North American Travel Journalists Association, and Best App in Sunset magazine’s Best of the West special section in the June issue of that magazine. For us here at Just Ahead, the results show once again that what we’re delivering resonates with travelers. By offering audio tours of national parks and scenic highways via smartphone, we bring great destinations to life. We inform, entertain, and guide readers to rich experiences of inspiring places. We’re proud and humbled that our product has been so warmly received!